Low GI main: Not only is this snapper dish low-GI, low in saturated fat and lower in sodium, it’s also a good source of protein and calcium. Soak raisins in verjuice for 5 minutes until softened slightly. Drain, reserving liquid. Meanwhile, combine thyme, zest and 2 tsp oil in a bowl. Season to taste and mix well to combine. Rub all over fish. Heat a large frypan over medium heat and spray lightly with the olive oil spray. In batches if necessary, cook fish skin-side down, for 5 minutes or until golden. Turn the fish and cook for a further 2 minutes until cooked through. Transfer to a plate, cover loosely with foil and keep warm. Whisk lemon juice, honey, remaining oil and reserved raisin liquid together in a bowl. Season to taste, then add the parsley, pine nuts, crumbled feta and soaked raisins and toss to combine. 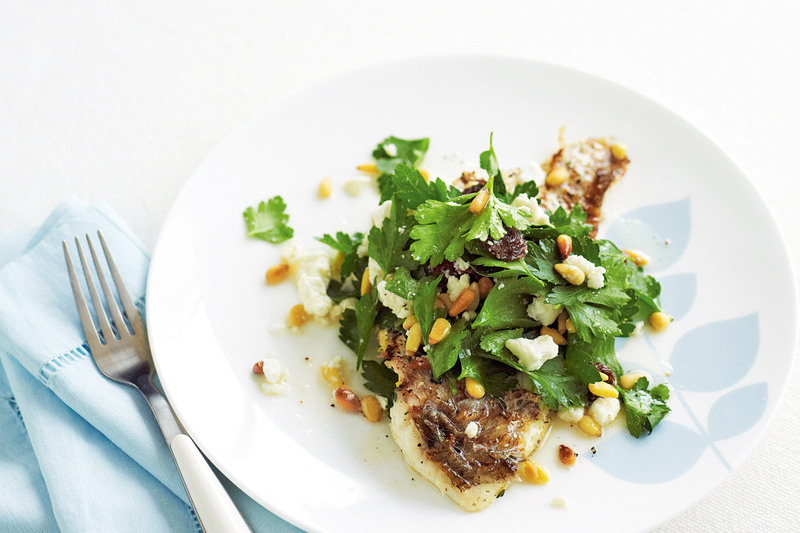 Serve the fish with the parsley salad. Verjuice is available from gourmet food shops and delis.